BEST. LASAGNA. EVER...ALL I NEED TO SAY!! To make the sauce, in a stockpot, combine the tomatoes, tomato sauce, water, onions, peppers, garlic, parsley, seasoning mixtures, sugar and bay leaves. Bring to a boil, then reduce the heat and simmer, covered, for 1 hour. Crumble the ground beef in a saucepan. Cook until no pink remains, then drain off the fat. Add the ground beef to the stockpot. Simmer for another 20 minutes. While the sauce simmers, cook the pasta according to the package directions (if sauce is too thin, for your taste, you can thicken it up at this time by mixing 1 tablespoon of cornstarch and a 1/4 of a cup of cold water. Bring sauce back to a boil. Stir in cornstarch mixture, stirring constantly). Remove bay leaves. 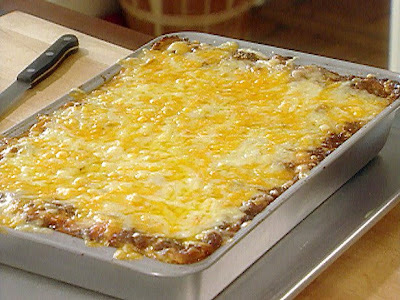 To assemble lasagna, place a thin layer of sauce in the bottom of a 9 by 13 by 2-inch pan. Layer 1/3 of each, noodles, cottage cheese mixture, Gruyere, Swiss and cheddar cheeses. Pinch off small pieces of cream cheese and dot over other cheeses. Add another layer of sauce. Repeat layering 2 to 3 times ending with sauce. This may be covered and refrigerated at this point. Bake for 20 minutes. Remove from oven and top with mozzarella and continue to bake for another 10 to 15 minutes. Note: If lasagna has been refrigerated, bake for 40 minutes total. Courtesy of my girl....Paula Deen!! Hey I found you through another blog and thought I would leave a comment. It sounds like we have a lot in common. Our names and two teenagers! That looks yummy! OMG that looks amazing!! Thanks so much for coming by my blog! Thanks for coming by my blog! That looks delicious!